Should Mozilla’s ‘anti-gay marriage’ CEO resign? Employees of software company Mozilla, best known for its Firefox internet browser, launch a Twitter campaign asking new chief executive Brendan Eich to step down over his stance on gay marriage. Mr Eich was appointed chief executive of Mozilla – an open source, not for profit organisation – this month, but the appointment provoked controversy because in 2012 it was revealed he had donated $1,000 to a campaign supporting a ban on gay marriage in California. His anti-gay marriage stance is perhaps even more alarming for Mozilla employees, considering that the company is to some extent aligned with the libertarian, open-source movement. In response, Chris McAvoy, a product lead on Mozilla’s badges project, tweeted on Thursday a call for the Mr Eich to step down. I’m an employee of @mozilla and I’m asking @brendaneich to step down as CEO. Mr McAvoy’s tweet sparked further calls for resignation from Mozilla employees. Have waited too long to say this. I’m an employee of @mozilla and I’m asking @brendaneich to step down as CEO. I’m an employee of @mozilla and cannot reconcile having @BrendanEich as CEO with our org’s culture & mission. Brendan, please step down. I’m an employee of @mozilla and I cannot reconcile @BrendanEich as CEO with our culture & mission. I cannot support @BrendanEich as CEO. People who do not work at Mozilla got involved. And then other Mozilla employees began tweeting their support for Mr Eich. I’m a bisexual employee of @mozilla and one donation to a personal cause is NOT reason enough for @brendaneich to step down. Please stay! I’m an employee of @mozilla and a supporter of LGBT rights and I ask @BrendanEich to keep being a great leader and step up as CEO. The one person who has remained quiet on Twitter since the furore began is Mr Eich himself. His last tweet, sent on Wednesday, pointed to a blog in which he sought to “lay concerns to rest” over his appointment. 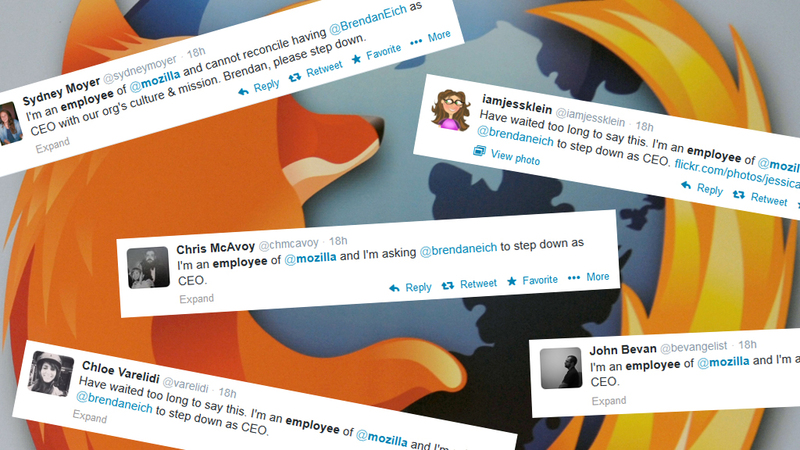 Do you think Brendan Eich should resign as Mozilla chief executive? Tell Channel 4 News below.